Data that amounts to a billion gigabytes is created in today’s world on a daily basis. In order to store data of this volume, it is essential that the space taken by each and every bit is as small as possible. A team of researchers from the Kavli Institute of Nanoscience at Delft University have reduced the space occupied to the smallest limit possible. These researchers have created a 1 kilobyte, 8000 bits, memory. Every bit in the hard disk represents the position of one chlorine atom. In theory, this storage density would allow all books ever created by humans to be written on a single post stamp. 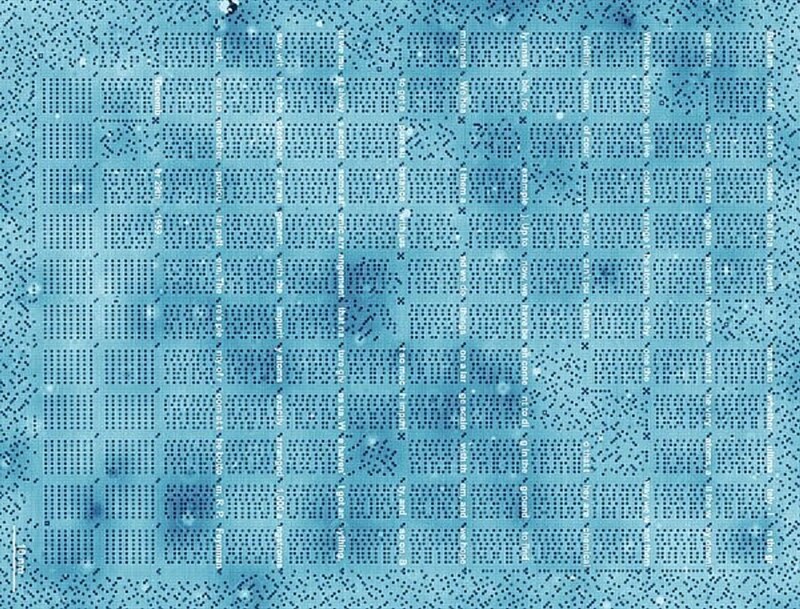 The team created a hard disk that is 500 times more effective than its industry-best commercial counterpart, and has a storage density of 500 Terabits per square inch (Tbpsi). The details of the research have been published in the July 18 issue of Nature Nanotechnology. In 1959, Physicist Richard Feynman issued a challenge to his colleagues to create the world at the smallest scale possible. In his renowned lecture ‘There's Plenty of Room at the Bottom,’ Feynman stated that if there was a platform to arrange atoms in an exact orderly pattern, it would be possible to store one piece of information per atom. A part of this lecture has been coded into a space that is 100 nanometers in width by the team in Feynman’s honor. A scanning tunneling microscope (STM) has been used by the team to pierce through each and every atom of any surface using a sharp needle. By probing the atoms the researchers can see as well as move the atoms. You could compare it to a sliding puzzle. Every bit consists of two positions on a surface of copper atoms, and one chlorine atom that we can slide back and forth between these two positions. If the chlorine atom is in the top position, there is a hole beneath it -- we call this a 1. If the hole is in the top position and the chlorine atom is therefore on the bottom, then the bit is a 0. The chlorine atoms keep each other in their place as they are surrounded by their counterparts in all places, except in the vicinity of the holes. This is why the method with holes is more effective than those with loose atoms and is better suited for storing data. The memory was arranged in 8 bytes-blocks (64 bits blocks) by the Delft researchers. A marker that is created by the same type of holes as the raster of chlorine atoms is present in each block. These markers are modeled on pixilated square barcodes or QR codes that are used for scanning airplane and concert tickets. They transmit the location information of the block on the copper layer, just like small QR codes. Any damage on the block caused due to any surface error or local contaminant will also be indicated by the code. Even if the copper surface is not in its best condition, this can lead to scale up in the memory, to a large extent. This new method provides opportunities for improving the scalability as well as stability. However, this new memory type will not reach datacenters in the immediate future. In its current form the memory can operate only in very clean vacuum conditions and at liquid nitrogen temperature (77 K), so the actual storage of data on an atomic scale is still some way off. But through this achievement we have certainly come a big step closer. The study was supported by the Netherlands Organisation for Scientific Research (NOW/FOM). Behavior of chlorine atoms has been evaluated by scientists at the International Iberian Nanotechnology Laboratory (INL) located in Portugal.